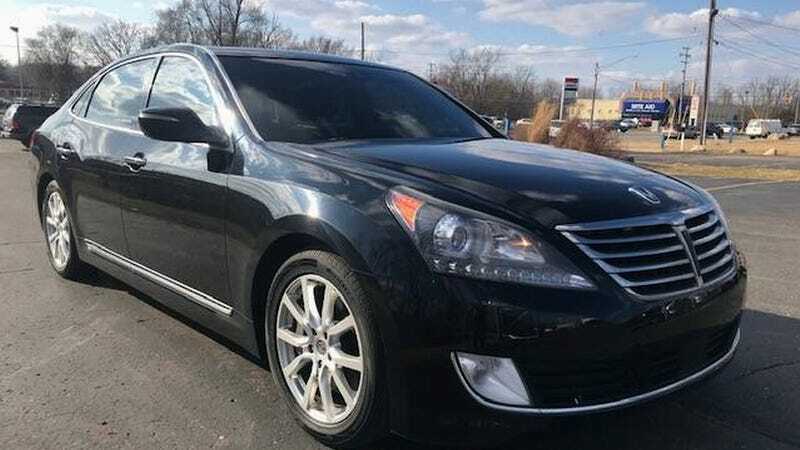 At $8,900, Would You Consider Horsing Around in This 2014 Hyundai Equus Ultimate? Being unmemorable is bad. Being unmemorable when you’re a car brand’s top model is unforgivable. Today’s Nice Price or Crack Pipe Equus once carried Hyundai’s halo, but you likely never gave these a second thought. Maybe this one’s price will finally make you sit up and take notice. Someone else’s project. That seems to be a death knell for any car here no matter what the price. It appeared to be especially so when applied to yesterday’s 1990 BMW 318i Touring that had been imported and then “somebody else’s project’d” to the tune of $35,000. Yikes! Fully 80 percent of you voted the car down in a Crack Pipe loss for that price and, to a certain extent, that reason. Geez, no wonder adoption agencies have such a hard time placing their wards. Today we’re featuring a car that’s not about the kids. It’s about the grandkids. That’s because this 2014 Hyundai Equus Ultimate is a car that was aimed at what we might call the “active senior crowd.” At least that’s the only people I’ve ever seen driving them outside of Hyundai’s HQ. The Equus takes its name from the Latin word meaning horse and served for a a time as Hyundai’s halo model. There’s also a disturbing play of the same same name that involves a kid cutting out horse’s eyes. I can see why Hyundai didn’t want to make that connection in any sort of ad campaign for their range-topping car. In point of fact, I can’t remember any sort of advertising for the car and honestly misidentify the model as a Buick on the rare occasions that I see one. That’s a misstep on my part because on closer examination, the Equus seems to be a pretty swank ride. The car after all, was intended by Hyundai to compete with the BMW 7 series, Mercedes S-Class and Audi A8’s of the world. No, it didn’t seem to really make an impression in that role and was eventually replaced by Hyundai’s Genesis uber brand. The few cars that did make it off dealer lots do seem to check almost all the right luxury and stately performance boxes. That means a somewhat nondescript body—here cloaked in elegant Caspian Black—sporting a Mercedes-like nose and plenty of brightwork. The bodywork on this one seems to be perfectly acceptable. There are no major issues visible nor is there any evidence of fading in the paint or top coat peel. Beneath that is an interior that honestly could be straight out of any of its German competitors. There’s copious quantities of burl wood in here as well as a whole second center stack in the rear armrest to give back seat passengers something to do. The only thing that gives me pause in here is the proximity and similarity in shape of the seat controls on the door and the handle that opens that door. I’d hate to reach over to relax my lumbar and accidentally pop open the door instead, dumping me out on the highway. Yes, I do suffer from irrational fears. This Equus is claimed to be a top ‘o the heap Ultimate model which means it carries every option short of an automated bidet. There are soft-close doors here, hot and cold running rear seats, and a freaking refrigerator in the rear arm rest to keep your leftovers fresh after a trip to Olive Garden. Everything looks to be in fine shape here too, and the center screen nav and reversing camera appear to work as they should. Under the hood lies Hyundai’s 410 horsepower, 5038cc “Tau” V8. Behind that is an eight-speed automatic, which sounds impressive but when I was a kid I had a 10-speed bike so they’ve still got a ways to go. The dealer offering this Equus claims the car to be “VERY CLEAN” and to carry a clear title. On the down side, it only comes with one key. The only other fly in the ointment here seems to be the car’s somewhat stunning 215,000 miles on the odo. That’s impressive, working out to about 50K per year, but it makes you wonder just how much of the car is left for you. This is also a remarkably complicated car offered by a company that made its name swimming in the shallow end of the pricing pool, so there’s that. It’s that milage that’s likely driving the car’s low-end of the scale $8,900 asking. When new, this Equus went for somewhere around $70K meaning it’s seen depreciation equatable to that of R. Kelly’s career. That however, also means that there’s a lot of luxury to be had at a respectively low price. Could This Equus actually be worth it? What do you think, is this Big Hyundai worth $8,900 with all those miles? Or, does the distance doom this horse to a last place finish? Saginaw, MI Craigslist, or go here if the ad disappears. At $35,000, Is This S54-Imbued 1990 BMW 318i Touring the Holy Grail or Just Holy Cow?